The Water Availability Tool for Environmental Resources provides a decision support system to examine different land-cover forecasts and climate projections using physical aspects of the basin that will remain unchanged, like topography and soil properties, to estimate streamflow for ungaged streams. WATER-DRB model parameters vary by land cover based hydrologic response units (HRUs) and were optimized for regional hydrologic simulations. These parameters control the soil-plant-water interactions for the hydrologic model. This enables scenario testing using land-cover forecasts because these ten parameters control how hydrologic response is affected following the transition from one HRU to another. Part of the Delaware River Basin Focus Area Study, the Water Availability Tool for Environmental Resources (WATER-DRB) was developed to provide a consistent and objective method of simulating streamflow under historical, forecasted, and managed conditions, with the goal of evaluating water availability. WATER uses a process-based decision-support system that estimates streamflow for un-regulated streams in the nontidal part of the Delaware River Basin using fundamental soil and topography interactions for three fundamental hydrologic response units (HRUs): forested, agricultural, and developed areas. By breaking up the landscape into these three HRUs, the fundamental interactions of topography and soils with climate and plants can be simulated while allowing for changes in land use and precipitation and temperature patterns. The WATER-DRB decision-support system provides a database of historical spatial and climatic data for simulating streamflow for 2001–2011, in addition to land-cover and global climate model (also known as general circulation model; GCM) forecasts centered on 2030 and 2060. WATER integrates geospatial sampling of landscape characteristics, including topography and soil properties, with a regionally calibrated hillslope-hydrology model, an impervious-surface model, and hydroclimatic models. Forecasted change in land cover for Christina River at Choochs Bridge, Delaware basin - USGS Site ID 01478000. Background is 2011 NLCD, with forecasted increase in developed area shown for 2030- and 2060-median aggregate land cover forecasts. In addition to the physiographic database that is provided with WATER, a 2010 snapshot of water use (Hutson and others, 2015) enables resource managers to incorporate historical water use or perform scenario testing of increased or decreased water use for each simulation using the WATER Application Utilities. Simulations can also be reformated as input to statistical or reservoir management software, like that used by the Delaware River Basin Commission. WATER was developed for users with the range of hydrologic understanding, geographic interest, and management responsibility included in the DRB stakeholder group. While the ability to simulate streamflow is the primary goal, many users will benefit from ready access to the database, land-cover forecasts, and climate projections that are provided with the model. The Delaware River Basin Commission is using WATER to evaluate water availability for the 2030 and 2060 target time periods and how this compares to the historical drought of record. Temperature conditions for a northern and a central basin in the Delaware River Basin. Forecasted conditions are shown for Representative Concentration Pathways 4.5 and 8.5, as averaged from four Global Climate Models. Individual calendar days were normalized (averaged) over 25-years of simlated hydrology. The average conditions from four global climate models include a 5-10% increase in precipitation in the Delaware River Basin by 2060 - amounting to as much as 230 millimeters per year (9 inches per year), with most of the increase between December and May. Simulations with WATER show that streamflow will generally increase in the basin, by 3-11% of historical conditions, as early as 2030, with continued increase to 2060. However, this increase is a result of higher winter streamflows which result from lower snowpack during December-March. Spring and summer streamflow (April-August) is projected to decrease for the northern and central parts of the basin, where most of the reservoir storage is located. This decrease in water availability when ecological and human needs are highest is a result of higher plant water usage that exceeds the projected increase in precipitation. Below are other science components of the Delaware River Basin Focus Area Study. 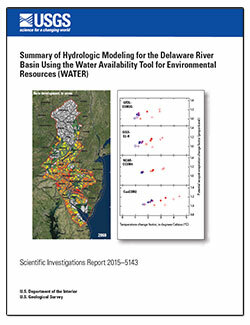 As one of several National Focus Area Studies within the USGS National Water Census (NWC), the USGS completed a 3-year study of water availability and use in the Delaware River Basin. The Delaware River Basin Streamflow Estimator Tool (DRB-SET) uses historical records of streamflow to estimate daily mean streamflow at any stream location within the Delaware River Basin for the period 1960-2010, incorporating basin characteristics such as drainage size, soil, geology, and seasonal precipitation. Water-use data were compiled or estimated for 8-digit and 12-digit Hydrologic Unit Code watersheds for 2010. Water withdrawal, interbasin transfers, return flow, and hydroelectric power generation release data were compiled for 11 water-use categories. The Riverine Environmental Flow Decision Support System (REFDSS), models of river temperature, and evaluation of methods of determining Habitat Suitability Criteria were all products of the ecological-flow science component of the Delaware Focus Area Study. Below are publications associated with the Delaware River Basin Focus Area Study. Williamson, Tanja N.; Nystrom, Elizabeth A.; Milly, Paul C.D. Williamson T.N., Nystrom E.A., Milly P.C.D. 2016. Sensitivity of the projected hydroclimatic environment of the Delaware River basin to formulation of potential evapotranspiration. Climatic Change 139:215-228. DOI: 10.1007/s10584-016-1782-2. Williamson, Tanja N.; Lant, Jeremiah G.; Claggett, Peter; Nystrom, Elizabeth A.; Milly, Paul C.D. ; Nelson, Hugh L.; Hoffman, Scott A.; Colarullo, Susan J.; Fischer, Jeffrey M.
Williamson, T.N., Lant, J.G., Claggett, P.R., Nystrom, E.A., Milly, P.C.D., Nelson, H.L., Hoffman, S.A., Colarullo, S.J., and Fischer, J.M., 2015, Summary of hydrologic modeling for the Delaware River Basin using the Water Availability Tool for Environmental Resources (WATER): U.S. Geological Survey Scientific Investigations Report 2015–5143, 68 p., http://dx.doi.org/10.3133/sir20155143. 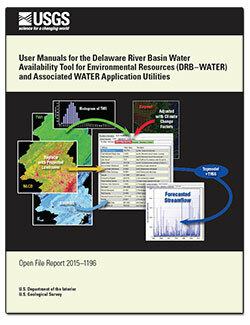 Williamson, Tanja N.; Lant, Jeremiah G.
Williamson, T.N., and Lant, J.G., 2015, User manuals for the Delaware River Basin Water Availability Tool for Environmental Resources (DRB–WATER) and associated WATER application utilities: U.S. Geological Survey Open-File Report 2015–1196, 32 p., http://dx.doi.org/10.3133/ofr20151196.